Examples of Johann Sebastian Bach played on piano are a dime-a-dozen today, but it was not always this way. Before Glenn Gould's seismic debut with the Goldberg Variations (Columbia) in 1955, Bach's masthead keyboard composition was considered beyond the capabilities of the modern piano. 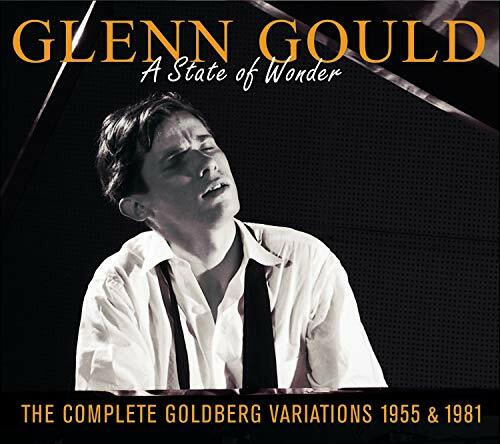 While Gould was not the first to record the Goldbergs on piano (he is predated by Claudio Arrau and Eunice Norton, both in 1942, Rosalyn Tureck in 1947, and George Demus in ca. 1952) he did record them definitively, making the piano an instrument for interpretation of pre-piano forte music. Gould's Goldbergs performance is what the artist is best known for, having been jettisoned into the stratosphere by the inclusion of the famous aria as soundtrack to an unspeakably grisly scene in Jonathan Demme's 1991 masterpiece Silence of the Lambs (Orion Pictures). In the soundtrack, the aria is played by director Demme, but the allusion to Gould could not be clearer. But Gould's Bach was but one part of this musical psyche. 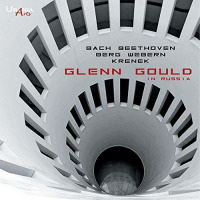 Gould also had a great command of Haydn, Mozart, Beethoven, and Brahms, and the pianist had great respect for the atonal 12-tone composers of the Second Viennese School: Arnold Schoenberg, Alban Berg, and Anton Webern, as well as, Ernst Krenek. Gould enjoyed world-wide acclaim, maybe as much for his various eccentricities as to his superior command of the piano. In 1957, Gould undertook a European Tour that included performances in Moscow and Leningrad, giving four performances in each city. That said, the performances on Glenn Gould in Russia: Bach, Beethoven, Berg, Webern, Krenek occurred at one of these eight shows. None of this music is unheard and is readily available on other labels. Cold War Russia was notorious for pirating clandestinely recorded live performances, releasing and re-releasing them ad nauseum on multiple labels all have illegitimate lineages. The pedigree of this present Urania Arts offering is, at best dubious, as evidenced by the complete lack of liner notes and the admission by the recording's producer that, ..."the producer was unable to trace the Author (or those entitles) of the picture here and on the cover." However, the recording's pedigree says nothing about the recording save for the possibly poor sonics, which are certainly present. A combination of the period and inferior taping gives rise to an extremely muddy sound to the recording. I find this allowable if what we have is an historic performance, and this certainly is. Gould was, and is, a phenomenon we must often be reminded of. He plays the complete Three-Part Inventions, BWV 788-800, as well as complete readings of Webern's Piano Variations, Op. 27, Bach's Piano concerto No. 1, BWV 1052, and Beethoven's Piano Concerto No. 2, Op. 19. Gould is flawlessly precise in his interpretations, playing them with spirt and praise. While the historical worth of this release remains in doubt, the performances don't. Track Listing: Bach: Three Part Inventions; Berg: Allegro form Piano Sonata No. 1; Webern: Piano Variations, Op. 27; Krekek: Allegretto piaceovole & Adagio for Piano Sonata No. 3; Bach: selections from The Art of Fugue, BWV 1080, selections from The Goldberg Variations, Piano Concerto No.1; Beethoven: Piano Concerto No. 2., Op. 19.